I could have titled this post "How not to taper for a race," but I'll just leave it as is and tell you about my bonehead experience "running" the dunes. 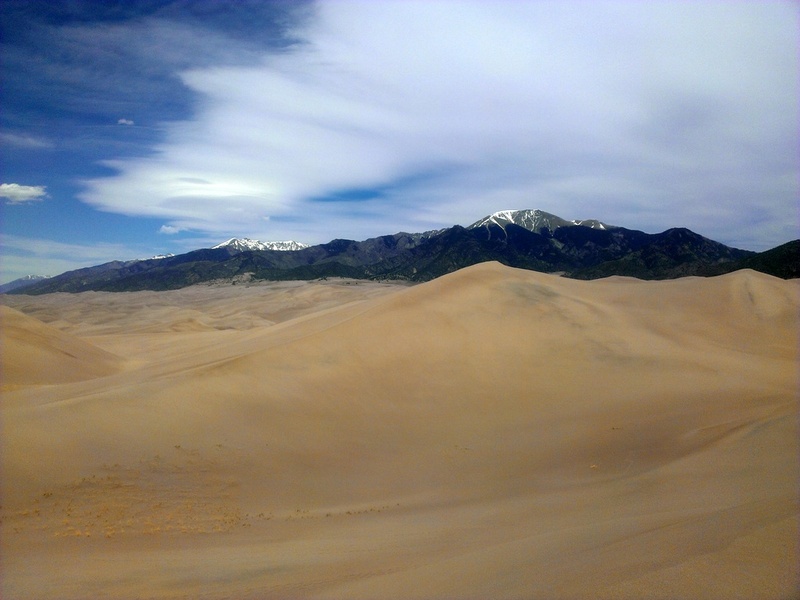 We spent the holiday weekend at the Great Sand Dunes National Park and I felt no pressure whatsoever to run. I wanted to go into the Golden Gate Dirty Thirty next weekend well rested, so I figured a hike of the dunes would be enough to satisfy my need to stretch the legs. 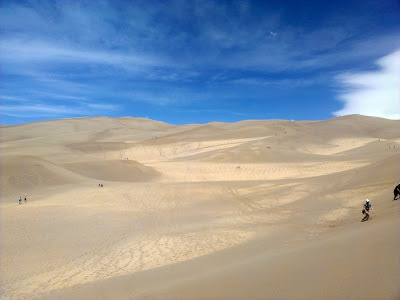 It had been a very busy week prior to leaving, so I spent no time at all researching the dunes, learning the do's & don'ts, or figuring out where I could get in a hike. If I gave reading the park guide five minutes of my time, I could have learned a tip or two that would have saved me some anguish. After settling in at Medano Creek around noon and eating lunch, the girls began to play in the water. 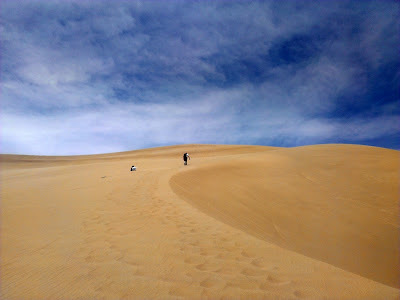 I saw my opportunity to slip away for the short hike to the top of the dunes. After crossing the creek, I had a couple football fields worth of flat and somewhat rocky sand to walk before the climb began. 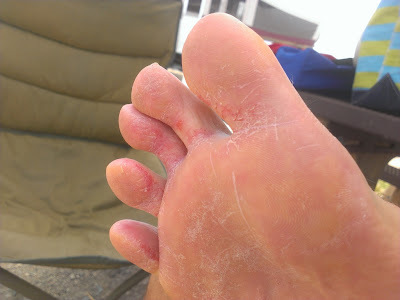 If I even had a 15 watt bulb burning in my head, I'd have noticed that walking barefoot wasn't very comfortable. As I began to ascend, the sheer force of the wind pretty much distracted me from all other things. I'm sure it was a normal windy day at the dunes, but if you haven't experienced pure sandblasting on your legs, you're in for a fun and somewhat painful sensation. The higher you got, the stronger the wind. Any ridge of a dune was particularly gusty. The video quality stinks, but you can catch the drift (pun intended) of what a hike up the dunes entailed. 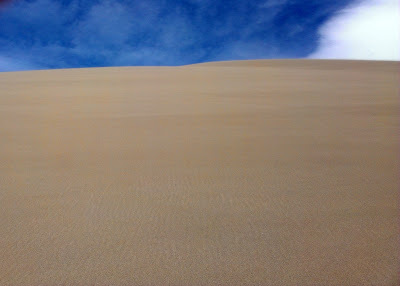 About halfway up, I began to notice just how hot the sand was. I felt like I was a frog sitting in a pot of water that was slowly coming to a boil. 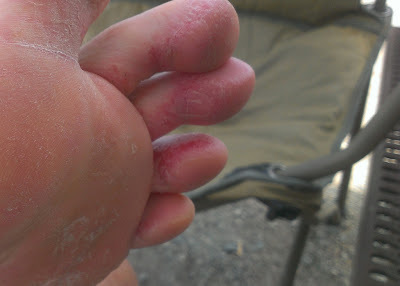 Eventually the heat became so toasty, that a "what the heck" moment happened and I looked down at my beet red feet. Stubbornness and summit fever prevailed. The steep climbs really were slow going. Another underestimation on my part. There were only a few people up this high. All of them had shoes on. I think the guy above also had summit fever as he left his wife to die so he could continue on. Nah, she was done and wanted to rest. When I hit the top ridge, I got a sweet view into the rest of the park. I still had a few hundred feet to go along the ridge to get to the official "summit," but my feet were wrecked and I could feel the blood in between my toes. I could also see a few people over there and their entire bodies were getting blasted by the wind and sand. Time to get off this awful ant hill. I ran down much of it just so I could minimize the time spent in the hot sand. I hobbled across the flat, rocky stretch and soaked my feet in the creek for a good 15 minutes. After getting them cleaned up, I took a few pictures since I'm not flexible enough to see the bottoms of my feet otherwise. I thought for sure I did more damage than what I found. And thankfully, they're healing up nicely. Back at our campsite at San Luis Lakes State Park - oh wait, they removed the word "Lakes" from the name because they let them all dry up. Check out their website for the water views we were expecting. Instead the lake is a dust bowl filled with fish bones. When the wind starts cranking, there are constant "tornados" that form from the white sand/dust in the lake. See below. 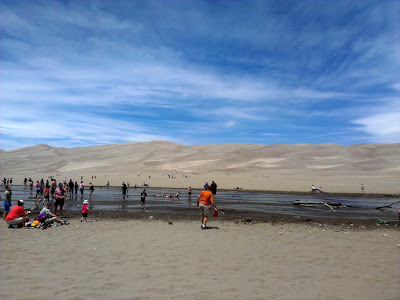 While the Sand Dunes were simply amazing to see, they were not kind to me. Maybe if I had read this tidbit of info in the park guide, I would've had a more positive experience. "On summer afternoons, the sand surface can reach 140°F (60° C). Bring closed shoes, and be careful with your pets’ feet. Hike the dunes early morning or evening during summer." Despite not being a fan of the desert-like scene of the San Luis Valley, we truly had a great weekend and I'll never get tired of sitting around a campfire and watching a view develop like the one below over the Sangre de Christos! The campsite sounded like a bit of a bummer, but hey, no mosquitoes, right? Glad the feet are OK. Bet that creek at the bottom felt amazing. Nice surprise to see you on the trail and to meet Tanya. JT mentioned he was over at Zapata Falls that day. Small world, and a fun place. We really enjoyed bumping into you! I'm so glad you said my name because I wasn't at all expecting to see anyone I knew. 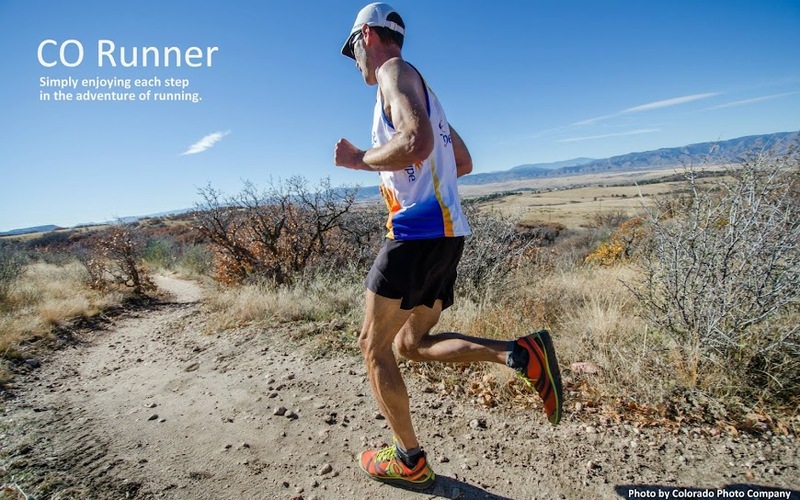 What a great running weekend you had down there! PS: Just a few mosquitoes, but there were these other tiny & hungry bugs (no see'ums?) that have me still scratching some of the bites. Hey Woody! Trying to get in touch with you before LT100. Hoping we could meet up sometime before the race. Shoot me an email! Also, the excellence of a pleasant teak wood cutting board will add to the structure of your kitchen.